1. My BFF at work had a baby on Monday! I am so flipping excited. Wish I could post pictures because she is the most gorgeous little girl EVER, but I don't dare do it without asking :) In other news, it stinks not having your go-to person at school! I keep finding myself walking toward her classroom out of habit and then reminding myself that she's not there haha. 2. 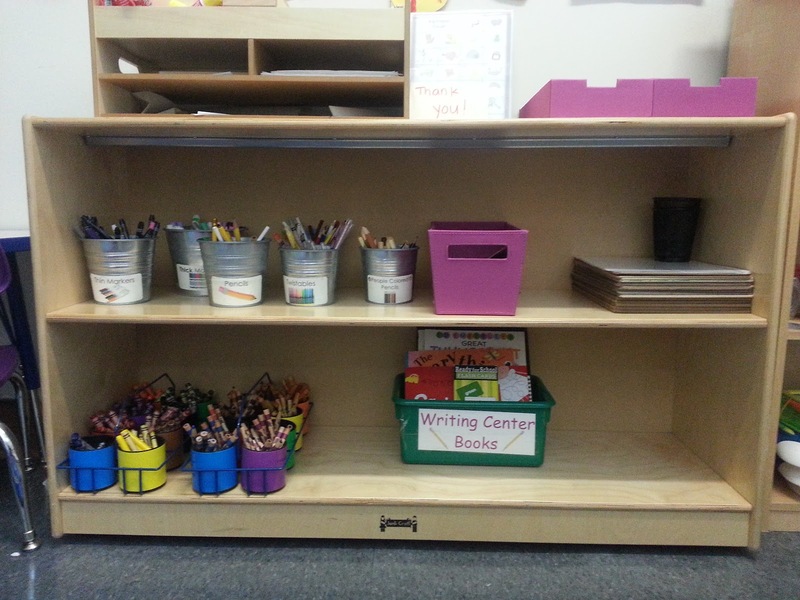 I reorganized my writing shelf and am so in love with it's new, simple self. I took this picture from kid height... I will have to add some better photos later! On the top left part of the shelf are my homemade writing cups. These hold thick and thin markers, pencils, colored pencils, twistables and multicultural crayons. The fuschia bin holds all of our word rings and writing cards. On the right are dry erase boards and erasers (I hold the dry erase markers hostage on my desk for my little friends to borrow. If I find one more without a cap I will scream!). On the bottom left are a crayon caddy and colored pencil caddy. Last but not least a bin of writing and drawing books. I like to keep these right in the writing center for easy reference, and also have a few of them displayed on top of the shelves. I am kicking myself right now for not taking better pictures! 3. We just had our fifth snow day this year (FIFTH! ), plus one hurricane day (Thanks, Sandy! ), and will now officially be in school until June 28th. WHAT?!? I grew up in Maine and never had so many snow days! 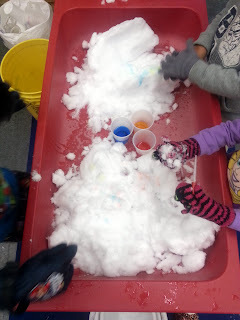 I tried to be a "glass half full" teacher and filled my sand table up with snow, eyedroppers and cups of colored water. My little ones threw on their gloves and LOVED this center! 4. I came home late on my birthday after having to go to a stinky class to this... an amazing steak dinner cooked by my fiance! This man does NOT cook, so the fact he made steaks, veggies and twice baked potatoes blue my mind. Trust me when I say that Whole Foods does not mess around when it comes to steaks... sooo delicious! Personally I am also a big fan of the mixing bowl turned wine cooler thingy. She turned her self pink? I can just imagine her face! Kids are so funny! I had something similar happen with one of my kids. She loves the color pink as well but she's in 1st so she didn't purposely color herself pink. But she did sniff my pink smelly marker so much that her nose and mouth area was covered with pink. This was 5 minutes before class pictures. We scrubbed but it didn't come off so I actually put some make up on her face to cover it up in the class picture. I really didn't want to have to explain a pink face! I found your blog through the 5 for Friday link up! 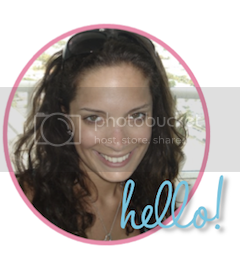 We have similar blog names so we must have the same view of Kindergarten! I love the pinkalicious story. As for snow days, we've had 3. we don't have to make them up until we miss 5 so we're good. Expecting a big storm tonight, but we are on Spring Break so no snow day. Not sure how I feel about a snow storm on Spring Break, but at least I'll have a good excuse to be lazy!